On the 1st of November, Jeremy Farrar, the director of the global medical research charity the Wellcome Trust and a former professor of tropical medicine at the University of Oxford, came to the Weston Library to deliver the annual Norman Heatley Lecture which this year celebrated the 75th anniversary of the first clinical trials of penicillin in Oxford in 1941. 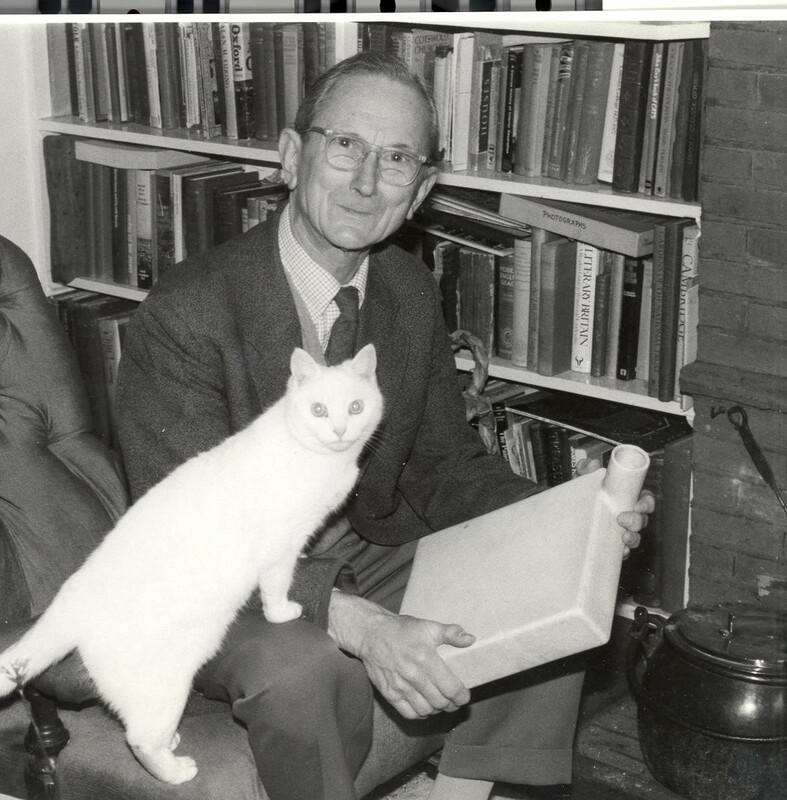 An older Norman Heatley (and cat) with one of his original ceramic penicillin vessels – a modified bed pan. Image from penicillinstory.org. In those very early days penicillin was enormously difficult to make, both unstable and finicky to extract. So difficult, in fact, that the patient in one of the very first clinical trials, a policeman called Albert Alexander, died when they ran out of the drug only five days into his treatment. It was Norman Heatley, who worked at Oxford’s Sir William Dunn School of Pathology alongside Howard Florey and Ernst Chain, who was the practical genius who invented the tools and techniques which made it possible to extract and purify penicillin in a large enough quantity to reliably use on humans. In this year’s Norman Heatley Lecture – “1941 to 2041– a changing world” – Jeremy Farrar focused on the astonishing advances in global health care in the 75 years since the development of penicillin, but also on some of the challenges that we now face. Those challenges include ever more antibiotic resistance; the greater likelihood of global pandemics as more people travel further, more quickly; and the sharp increase we’ve seen in the amount of time it takes to get from the research stage to a workable, useable drug. 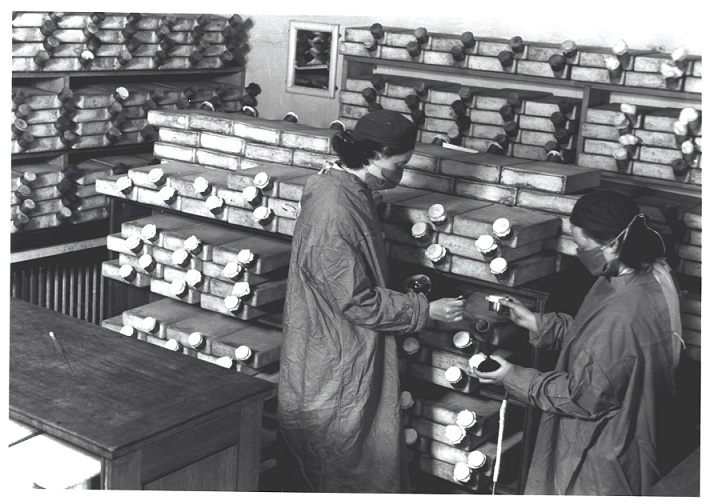 Two technicians extracting penicillin in the Sir William Dunn School of Pathology, University of Oxford, using Norman Heatley’s modified bedpans, 1941. To accompany the lecture a small display in the Weston Library’s Blackwell Hall featured items from the Bodleian’s important collection of documents from the early years of antibiotics, including this photograph of two of the “pencillin girls” (Ruth Callow, Claire Inayat, Betty Cooke, Peggy Gardner, Megan Lankaster and Patricia McKegney) who were recruited to make enough of the drug for clinical trials.